Why does a frozen fizzy drinks can burst open? 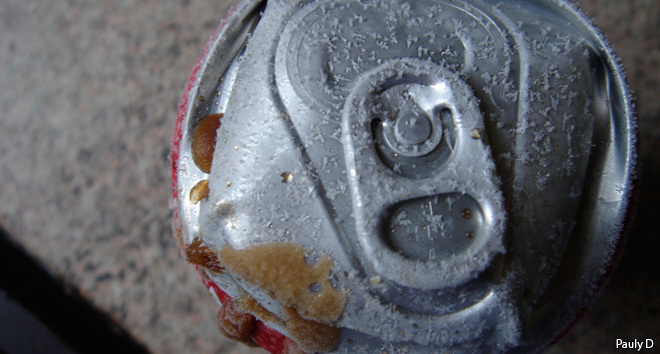 The reason a can containing a fizzy drink bursts open when you freeze it, has nothing to do with the presence of carbon dioxide (the gas that makes the drink fizzy). In fact, if you fill a glass screw-cap bottle to the brim with normal tap water and freeze it, the glass will still crack. The reason behind these phenomena is the strange behaviour of water, unlike most liquids, that it EXPANDS when it turns from a liquid into a solid. So, the same amount of water molecules takes up more space when they have solidified into ice. The metal or glass walls of the container restrict the molecules from taking up this space, so they are just pushed out of the way, leading them to buckle and/or break! It is certainly true that pure water expands in volume (about 9%) when it freezes, but I do not believe the dissolved carbon dioxide (CO2) is irrelevant. CO2 is quite soluble in cold water but has very low solubility in ice. So, as the soda freezes, the CO2 is driven out as a gas in the head space above the liquid. I have read that there is about 2.2 gram of CO2 in a can of Coke, and that would occupy a volume of about 1 liter at 0°C and atmospheric pressure. This is why, if you melt the soda from a frozen can, you will find it to be “flat”.